This green yarn is the one that doesn't photograph true, Ella rae Classic #90--it's darker, a rich emerald, so the contrast with the blue is much less in terms of light/dark, and more in terms of pure hue. I really like the colors together. 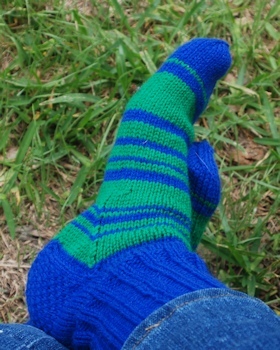 I was pushing to finish them in the last week of September and ended up with a longer blue stretch on one toe than the other, but...since I wear them with shoes, who will see them to point out the mistake? I wear them with shoes. It's our little (*ha*) secret. As usual, I put them on right away and wore them the rest of the day, which I find "sets" the fit well. Today they've had their first wash and though they may not finish line-drying today (didn't get them out first thing as it was cloudy and looked like it might drizzle) they will benefit from the experience. 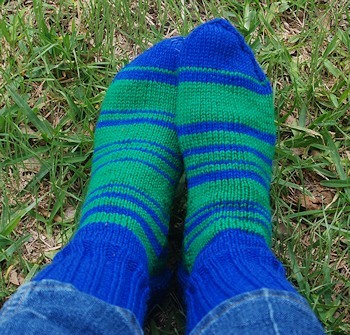 Young socks need to be exposed to the real world (yes, that is sort of a joke. OTOH, I think line drying improves many things, esp. on a breezy day like this. The new "leading" pair on the needles is the variegated red/purple Mountain Colors "Indian Paintbrush" yarn. Next up on the needles these came off of--the next "following" pair--will be a pair of Herdwick yarn socks, the super-warm & durable coldest-days-of-winter sock. They feel wonderful on a cold day! 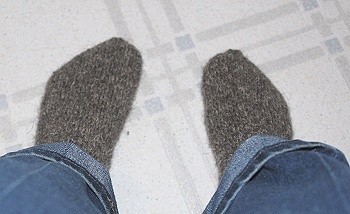 I could stand sock-footed on our kitchen floor when it was in the 20sF outside (and the house has a crawl space--that kitchen floor gets COLD--and my feet did not chill at all. I couldn't feel the cold coming through. 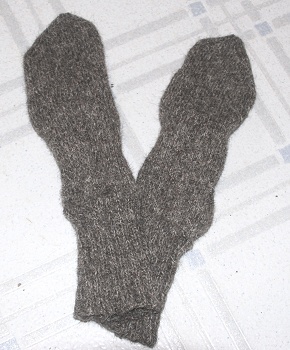 I don't need lots of pairs of these--we don't have that many days in a row of serious cold--but I want enough pairs that the first-cold-day's socks have time to dry before the end of the cold spell. And it can take them four days to dry indoors in cold weather. So 4-5 pairs. I am highly envious of your socks and hold you in awe.